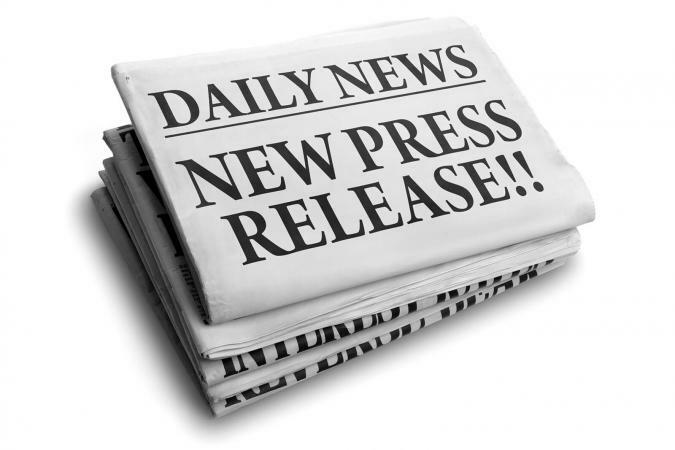 Press releases are an important part of every business marketing and public relations strategy. The goal of a press release is to create sufficient interest to generate a news story in media outlets. To do so, you must provide a professionally-written and formatted press release. Press releases must be about an interesting, newsworthy topic. They must also be well-written and formatted properly. Include a catchy but newsworthy headline, such as "Free Web Class Helps You Maximize Your Retirement Savings," or "ABC Company to Aid Local Charity." Include who, what, when, where, why, how in the first few sentences. For example, "ABC Financial will hold an online financial planning class next Thursday on their website, ABCFinancial.com." Fill in remaining paragraphs with important descriptive information about your subject. Include a quote or two from someone about the topic, such as "According to ABC Financial President John Smith, 'The number one request we get from customers is that we help them find ways to grow their nest egg without a huge outlay of cash.'" Avoid text that uses marketing lingo or that comes across as salesy. In other words, don't make your press release an obvious advertisement. Stick to the facts and avoid superlatives and buzzwords such as "core competency," or "seamless integration." If you would like to use a template to ensure that your document is properly formatted, use the free printable press release template provided here. Click the image to the right, and a pre-formatted press release template will open as a PDF document in a separate window. If you need assistance with the document, use this guide for Adobe printables. You'll be able to save, edit, and print it for your own use. 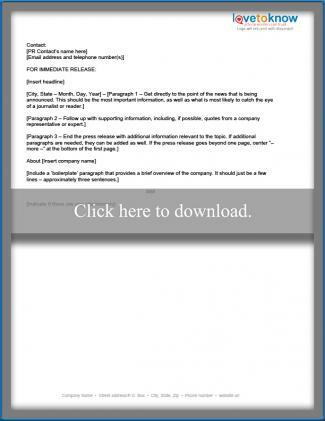 Click to download a press release template. Type the contact person's name, phone number, and email address at the top of the document. Justify your columns to the left and use single spacing for body text. Use a professional font such Calibri or Arial. Make sure the font is an easily readable size, such as 12 point. Type "FOR IMMEDIATE RELEASE:" (in all caps, bold). Type your headline in bold using title case (initial capital for each word except conjunctions, articles, and prepositions). Enter a date and location line using the body font you will use for your article, but italicized. For instance, Bellevue, Washington - February 12, 2013. After the date, change to non-italic font, type an em dash (--) and begin typing your press release. Use mixed case for the release. Leave one space between each paragraph. If your press release is more than one page, at the bottom of each page type (more) on the final line. On additional pages, type the page number on the first line, the title of the release on the second line, and then leave a space before continuing with the body. Conclude the press release by typing either "###" or "(end)". Fullerton, California - April 20, 2013 -- ABC Restaurant, a popular downtown Fullerton establishment, is pleased to announce its new partnership with the Orange County nonprofit, Meals for the Homeless. Building on a long tradition of philanthropy, the restaurant seeks to minimize food waste while putting extra produce and meat toward a good cause. "We regularly have to throw away food products we don't use at the end of the night," says Chef John Paul. "What better way to utilize perfectly good food than to create delicious soups and stews that can be used by Meals for the Homeless?" According to Paul, ABC Restaurant began the partnership last week after learning of the nonprofit's widely publicized budget shortfalls. The company plans to continue the program throughout the winter and spring when need is at its highest. Seattle, Washington - August 13, 2013 -- Seattle broker Maypole Reality welcomes Andrew Barton as the new head of their commercial brokerage. Formerly with Century 21, Barton has more than 25 years experience as a King County commercial real estate broker. "We were looking for someone with Andrew's unique skill set," says Maypole owner Luanne Mitchell. "We are delighted that someone of Andrew's experience has agreed to head up our commercial division." With more than 25 years of experience, Barton has played a key role in the transfer of some of the area's most desirable commercial properties. Along with membership in the National Association of Real Estate Brokers, Barton is a member of the Million Dollar Round Table and holds a Masters in Business Administration from the University of Washington. A well-written, properly formatted news release submitted to appropriate news organizations provides an effective public relations strategy to generate positive press about your company. By paying careful attention to detail and offering interesting information, you can keep your name in front of potential customers and improve your company's reputation.